With cheese.Fresh 100% USDA prime ground beef, seasoned and stuffed in a flour tortilla, deep fried till golden brown. 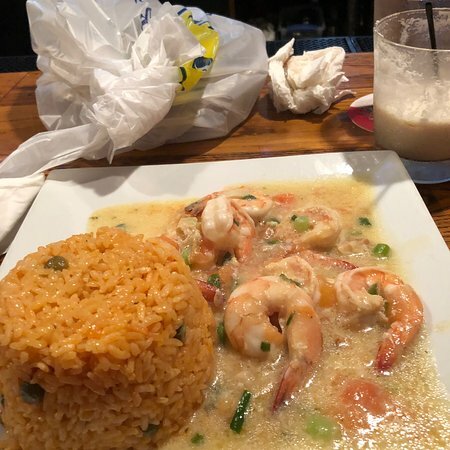 Tender​ shrimp with a garlic butter sauce, stuffed in a flour tortilla deep fried till golden brown. Fresh Yukon gold potato mashed and stuffed with seasoned fresh 100% USDA prime ground beef. 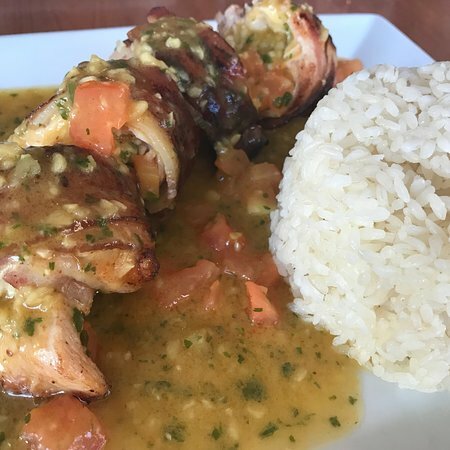 Jumbo lobster meat, seasoned with fresh herbs in garlic and lemon butter sauce and stuffed in a flour tortilla fried till golden brown. 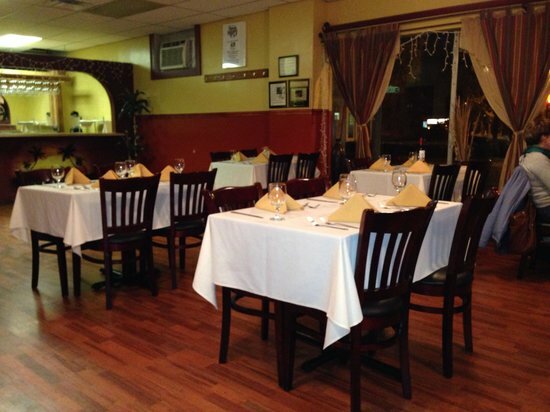 Jumbo lobster and crabmeat – seasoned with fresh herbs and spices, fried to golden brown. Pan seared, chicken breast, with shrimp, spanish sauce, chorizo and topped with cheddar and smoked mozzarella cheese, served with garlic crostini. Boiled Yuca marinated with, onions and garlic mojito. Shrimp with diced tomatoes, onions and peppers, marinated with olive oil and fresh lemon juice over a bed of lettuce. Octopus with diced tomatoes, onions and peppers marinated with olive oil and fresh lemon juice over a bed of lettuce. Diced peppers, onions, tomatoes, scallions, lime juice, olive oil and vinegar over a bed of lettuce. Octopus, shrimp, crab meat, lobster meat, diced tomatoes, onions, peppers marinated with olive oil, fresh lemon juice and spices over a bed of lettuce. Mixed greens with pan seared steak, carrots, roasted corn, avocado and diced tomato topped with crumbled blue cheese. Mixed​ greens with sliced tomato, carrots, cucumber and black olives with house dressing. All sandwiches are Panini pressed.Sandwiches and wraps are served with your choice of fries or plantain chips. Grilled ham with caramelized onions, melted Swiss cheese, lettuce and tomatoes served with honey mustard sauce. Marinated, grilled chicken with crispy bacon, lettuce and tomato, topped with melted cheddar cheese. Fresh garlic and basil marinade, zucchini, squash, roasted red pepper and portabella mushroom in tortilla wrap with lettuce and tomatoes. A​ sandwich of pulled roast pork, ham, swiss cheese, pickle, lettuce and tomatoes served on a fried plantain with garlic mojito. Marinated cube steak with caramelized onions, pepper, topped with provolone and Am.cheese and smoked mozzarella. Beer batter fried Tilapia with caramelized onion, lettuce, tomato and homemade Cuban red pepper relish. Pulled pork with sliced red onion, lettuce, tomato, in Tata’s Special spicy sauce. 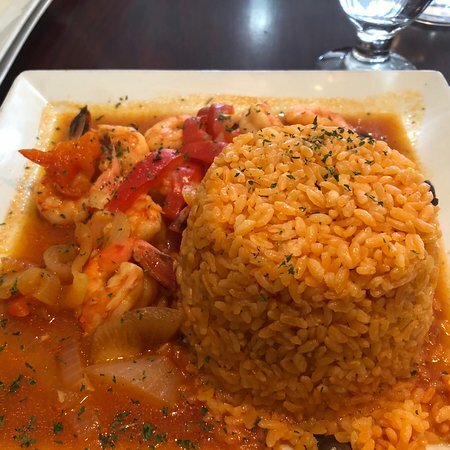 Served with choice of Spanish or white rice with beans, or a side of fried plantains (Tostones) instead. Marinated pork medallions deep fried till crispy tender; served with garlic mojito. Chicken pieces marinated in garlic, olive oil and fresh herbs and deep fried till golden. A slowly cooked ¼ chicken marinated in garlic herbs and rotisserie until golden and tender. 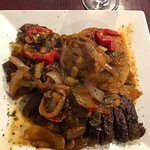 8 oz.Cube steak marinated and pan seared with caramelized onions, diced tomatoes and scallions. Slowly cooked 100% USDA prime beef with potatoes. Sauteed shrimp with garlic, olive oil and herbs finished with garlic butter sauce. 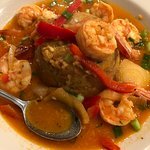 Sautéed shrimp with onions and peppers in a red Spanish sauce. 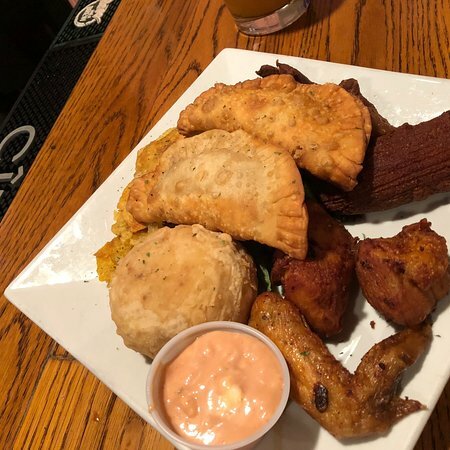 All dinners served with choice of spanish or white rice with beans or choose a side of fried plantains (Tostones) instead. Chicken al Ajillo diced chicken breast marinated in garlic and oil, pan seared with fresh herbs and finished with a garlic sauce. With concasse of tomato, roasted garlic, finished with fresh basil. Marinated cube steak pan seared with caramelized onions. Oven roasted beef roast with spanish olives, diced carrots, onion and potato. Marinated pork medallions with fresh garlic, herbs and olive oil, deep fried till crispy tender. Pan seared pork chops with caramelized onions and roasted red peppers slowly cooked in a spanish sauce. Marinated whole red snapper with fresh garlic, olive oil and herbs, stuffed with shrimp, lobster and crabmeat. 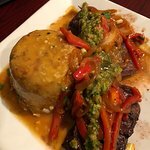 Mofongo with fried pork medallions fried plantain mashed and stuffed with pulled pork and served with fried pork medallions and finished with a garlic sauce. Fried plantain mashed and stuffed with spanish style shrimp and finished with a garlic sauce. La camarera llamado Spit Trinity en mi ensalada! Guardar la sal Por favor! Auténtico Latino comida mejores en el estado. 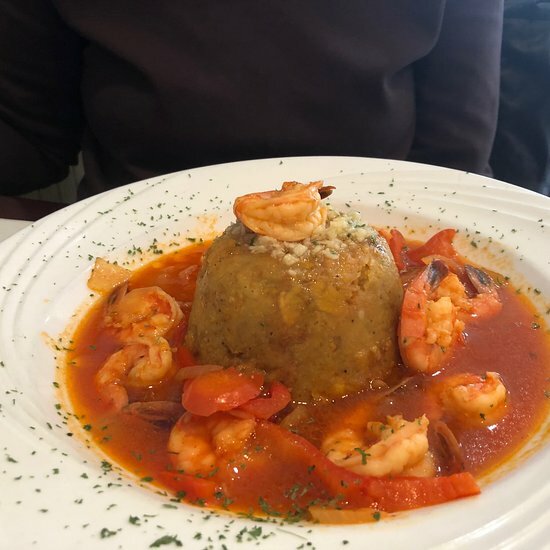 Tenía el Mofongo y sandwich cubano. Excelencia! Limpio y agradable en pintoresco centro Wallingford junto a la estación de tren. Amplio parking al otro lado de la calle. Precios muy razonables. Buen vino y bar completo! Patatas con carne y patatas ', con golpes fuertes, en la parte de atrás no volvería. 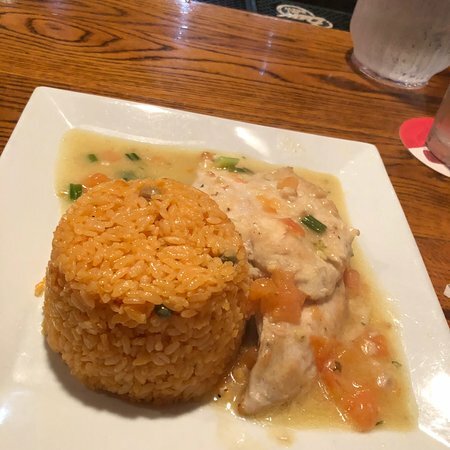 El arroz española fue bueno. He tenido muchos platos aquí, pero últimamente gestión parece desorganizado. El bar está mal gestionado, el servicio es deficiente y a menudo se les falta personal, que de alguna manera interfiere con la comida que se cocina. The Southern Connecticut Wine Co.
Obtén respuestas rápidas del personal y los visitantes anteriores de Tata's Restaurant.